US envoy blasts Hamas after Palestinian Arabs spotted celebrating deadly terrorist attack on Israelis. Supporters of the Hamas and Islamic Jihad terrorist organizations in the Hamas-ruled Gaza Strip celebrated the pair of terror attacks targeting Israelis in Samaria Monday, distributing candies and pastries to Gazans after word reached the Strip of the attack. On Sunday, a Palestinian Arab terrorist stabbed 19-year-old IDF soldier Gal Keidan to death at Ariel Junction in Samaria, stole his fire arm, and proceeded to open fire on Israeli vehicles before stealing a car and driving west to Gitai Avisar Junction, where he shot and wounded a second IDF soldier. A third Israeli, Rabbi Ahiad Ettinger, was critically wounded in the attack. 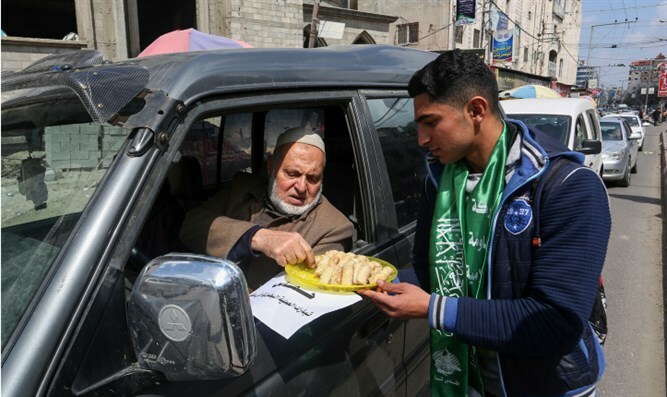 After news of the attack spread, Gazans wearing scarfs bearing the names of the Hamas and Islamic Jihad terror groups were spotted handing out candies and pastries to locals in the southern Gaza Strip cities of Khan Yunis and Rafah to celebrate the attacks. The US condemned the attacks, as well as the Hamas and Islamic Jihad terror organizations for condoning them. “We condemn today’s brutal attack by a Palestinian terrorist who murdered at least 1 Israeli & injured others near Ariel,” White House special envoy Jason Greenblatt tweeted Sunday afternoon, responding to reports of the celebrations in the southern Gaza Strip.